In this article we will show you, How to write Java Program to find Area Of Rectangle and Perimeter of Rectangle with example. 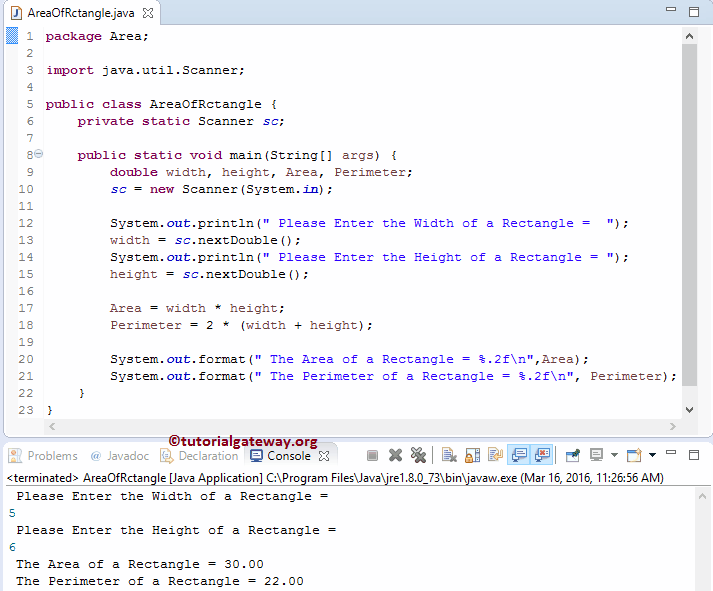 Before we step into the Java program, Let see the definitions and formulas behind Perimeter and Area Of Rectangle. This Java program allows the user to enter width and height of the rectangle. Using those values we will calculate the Area of a rectangle and perimeter of a rectangle. Following statements will allow the User to enter the Width and Height of a rectangle and then we are going to assign those values to already declared variables called Width and Height. TIP: You can remove the second System.out.println statement to shorten the code. This Java program allows the user to enter width and height of the rectangle. In this example, we are going to use the logic that we specified in first example but we will separated the logic and place it in a method. In this example, we are dividing the code using the Object Oriented Programming. To do this, First we will create a class which holds a methods. First we declared a function AreaofRectangle with two arguments. Within the function, we are calculating the Area and Perimeter of Rectangle using respective mathematical formulas. Within the function, we used the System.out.println statement to print the output. Next we declared a RectangleArea function with two arguments of type double. Within the function, calculating the Area of Rectangle and we are returning the Value. Next, we are calling the AreaofRectangle method. Note, this is the first method that we created with void keyword and this method will calculate Area and Perimeter and print the output from the AreaOfARectangle Class itself. Next, we are calling the RectangleArea method. This is the second method that we created with double data type and this method will calculate Area and return a value so, we are assigning the return value to Area variable.